Buy the 3hp saw and save up for the planer. A good saw is a lifetime purchase for a hobbyist so buy the best you can and you’ll never regret it. I’ve found that unless I am working with sheet Goods, I use a planer on every project. I have a Dewalt 735 and am content with it. Unfortunately, I only have space for a folding table saw, so I got the Sawstop Jobsite. I couldn’t imagine making anything decent out of solid lumber without running it through the jointer and planer (without a ton of annoyance). I would get a lower end Saw and go for a Planer (and a Jointer). Buy the 3hp saw and save up for the planer. A good saw is a lifetime purchase for a hobbyist so buy the best you can and you ll never regret it. +1. You can buy a lot of S2S lumber for the price of a planer. Invest in the tablesaw. It’s the most important tool you will ever buy. You will never be sorry about a 3HP saw. You WILL be sorry with an underpowered one. Is it just me, or has everyone forgotten about used? You can find really nice Powermatic and Delta, American made, used for some really great prices. I was at a cabinet shop closing down and the guy was begging me to take his 3HP Delta for 500 bucks. Buy that Grizzly G0690 3hp 220v cabinet saw. I have had mine for 7yr and have nothing but praise for this table saw. Grizzly 690. I’ve got the 691 (longer fenec) and like it a lot. Save up for the planer. You could buy the DW734 and save a couple hundred… I’ve used both and don’t really see any benefit to the DW735… Just a suggestion. I agree with PPK, buy DW734 for hobby purpose. I am been using DW734 and it is a nice planer. Buy G1023RL, and use saved against G690 money for the planer. 1024 is a newer design with vertical tunnion lift, while G690 has more traditional tilting trunnions. Otherwise both these saws are comparable in their abilities. I expect that you get an advise to buy some used saw. It is a lottery I normally do not play. You may or may not get a good deal but the amount of time and energy you spend on it usually overweights the benefits. (true for my location other places may vary). Even though it would likely suffice, the G0690 is a much more substantial saw than the G0771Z and would likely be the last saw you’d ever want or need. I’ve never regretted stepping up a level on a table saw. The G1023RL is also a much more substantial saw than the G0771Z….I like the idea of saving a few hundred for the same capability and going with the G1023RL and the DW734. If you’re concerned about the 26” rip capacity of the G1023RL, it’s really simple to slide the front rail over the right for closer to 36” rip capacity. Truly you need a planer even if you buy S2S as most ‘dimensional’ lumber isn’t. It’s tough to make perfect joinery with slabs of slightly different thicknesses. Since I was having to plane S2S to a uniform dimension anyway I went to rough lumber and never looked back. The fence is the most important part of the saw. Whatever saw you get put an incra LS-III fence on it and you’ll never be sorry. RJ, welcome to LJ’s you don’t say where you’re at or else I’d peek at your CL tools page. I’m in the DC area and do pretty well with finding tools etc for reasonable prices, which if you’re near a fairly heavy population density may pay off for you. I build furniture for therapy and my mental condition, it’s nice to know that my pieces will likely outlive me unlike the food I create which literally turns to $hit within 24 hours. I would LOVE to have a cabinet saw, but can’t really justify the $$$ or the space yet, (2 car garage shop that often has one parked in it). 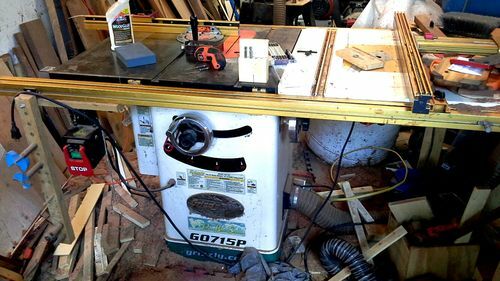 I have a Rigid/Craftsman saw and the DW735 which I upgraded from a planer similar to the DW734. I also have the Ridgid bandsaw & jointer. When my wife & I sell this house and move into our grow old home I hope to actually have a detached shop where the tools are just waiting for me to turn them on rather than move everything around and set DC etc. I have a local sawyer and get good prices for rough lumber and greatly enjoy being able to get dead nuts flat square stock for my furniture because it solves so many problems with the later joinery. I do believe cheap tools are more expensive and my father and grand father always said to buy the best tools you can afford rather than paying multiple times. IMO look to set yourself up with the saw & planer and watch CL for a jointer to round out your milling capabilities.